I have been thinking recently about starting a subscription newsletter based on some of the ideas I write about on this blog. Before I commit to doing anything I want to see if there is enough interest to support the idea of a newsletter. I have an outline of what I'd like to include along with pricing and subscription details below. As you read my vision for a newsletter if the price and terms are acceptable would you please subscribe to the mailing list for more information? I'm going to use the mailing list to gauge interest. If I have enough interest I will start a newsletter. The first question is what will happen to the blog? I don't plan any changes for the blog, I will continue to post as I have in the past. My posting dropped off in the last week because I went skiing in Utah for a week. A bi-monthly newsletter with a focus on 'oddball stocks'. This means stocks selling below book value, net-nets, strange unlisted stocks, and other companies that I find fascinating. Stock picks would be global in nature. Don't worry, I'm not going to fill the newsletter with all picks from Kazakhstan, or some crazy market. Everything will be purchasable, and I will verify that before profiling anything. As appropriate profiles and relevant data about attractive unlisted investments. A profile, or profiles of attractive bank investments. The profiled banks will include a sizable amount of data sourced from CompleteBankData.com. Other thoughts or musings on the markets or life in general. As appropriate other articles relevant to investors by guests. For example, if a spectrum engineer wanted to write a tutorial on wireless spectrum that might be included. Ideas presented in the newsletter would be exclusive to the newsletter, they will not appear on the blog. Subscription price would be $299 per year for six copies. The newsletter would be distributed digitally, unless enough subscribers wanted a printed copy. If you prefer print please email me or leave a comment on this post. Does this sound like something you'd be interested in subscribing to? If so please sign up using the form below for more information. Subscribe for more information about an Oddball Stocks newsletter. You might be wondering why I have a first name and last name component to the sign up form. If you are uncomfortable giving me your name then you would probably be uncomfortable giving me your money as well. I'm only interested in serious potential subscribers. In most companies the person who knows the most is seated in a corner and quickly approaching retirement. They've accumulated their knowledge through years of experience. To an outsider their experience and knowledge might not mean much. A handful of procedure codes, or special procedures and approaches to solve specific problems. Their knowledge is stored in their mind and scattered amongst hundreds of emails. Something like this might sound preposterous to an outsider, but every company has someone like this. I'm convinced that as we get older instead of knowledge increasing our knowledge of what we don't know increases. There is great power in understanding what we don't know. My soon to be four year old son recently proclaimed that he "knew everything about airplanes." He proceeded to tell his grandmother that if she ever had any questions about airplanes she should ask him. The punchline is that his grandmother has worked for various airlines for a significant portion of her career. This seems like a silly story, of course a child doesn't know everything about airplanes, how could he? The problem is many investors act like my son. He watches a few shows about airplanes and suddenly he's an expert. Investors read a few books about an industry and suddenly they're experts. Both are blinded by what they don't know. What we need is more humility and less arm chair experts. As investors we're looking at companies from the outside. Our interface to operations are financial filings, and whatever other industry information we can gleam. Investors who consider themselves experts might only have the knowledge equivalent of an average industry practitioner. Humility is needed to recognize that we don't know as much as we think we do, and that we're wrong more than we'd like to be. I think it was Charlie Munger, or John Templeton who said that investors only need to be right 60% of the time. If that's true that means 40% of our decisions will be wrong. Not slightly wrong, or off by a hair, but completely wrong. In school answering questions correctly 60% of the time resulted in the lowest passing grade possible. Yet in the investing world it signifies considerable success. Value investing is successful because it is a system that attempts to handicap unknown risks related to an investment. We might want to be experts, or think we're experts, but we need to recognize we're not. Once we realize we're not experts we can start to take advantage of the handicaping system built into value investing. Is a company facing a lawsuit, and the liability a wide range of outcomes? Seek a bigger discount. Does the company's management leave much to be desired? Seek a bigger discount when purchasing. Are the quality of assets questionable? Seek a bigger discount. Unlike some aclaimed value investors most of my investments have a bit of hair on them. I'm not in the business of buying good companies at great prices. Because of this many of my potential investments are trading at low multiples. The only protection I have when I purchase is the discount to intrinsic value. The larger the discount the more protected I am from negative outcomes. It's likely that something negative will happen to a holding, but I am protected because I purchased so cheap. If a company with a 2x earnings multiple reports that earnings fell 50% I now hold a company at 4x earnings, not a terrible position to be in. We need humility to recognize that we're not experts in our holdings. When we're not experts we need a larger handicap against bad situations. The more unknowns and the more unknowables the larger the discount. One of the biggest mistakes we can make is thinking that we are more knowledgable than others, and because of that we don't need as large a discount to intrinsic value. Investors playing this game are taunting the odds. For that to work out investors need to be right, and as noted above being right only happens about 60% of the time for the best of us. It's alright to admit we don't know everything about an investment. It's alright to have a simple investment thesis. Understanding our own psychology and working with it is better than fooling ourselves into losses. When most investors think of a net-net they're thinking of Alco Stores (ALCS), knowingly or unknowingly. A chain of retail stores that could be described as the modern day general stores. Where else can you buy a tablet computer, a mattress, and yarn supplies at the same time? The company's stores are located in towns too small to merit a mention on an interstate exit sign. If a stuck-in-time business model isn't enough the company has traded near or below NCAV ever since the financial crisis. Many investors avoid net-nets because they fear being stuck in an investment like Alco Stores. A company headed nowhere with a management whose heads are stuck in the sand. With a dour story and low valuation investors lose hope as their IRR trends towards zero. This is the what many people envision when they think of a net-net. The company's story started to get exciting in July of 2013 when management announced a going private transaction at $14 a share. The going private offer was 63% higher than where shares had traded previous to the offer. The only problem was shareholders didn't quite see the deal as fair. Management's $14 per share offer valued the company for slightly more than NCAV, a classic take-under. Two things happened in the ensuing three months. The company's management sent a number of notices to shareholders reiterating that institutional proxy companies endorsed the deal. But more importantly observers were offered a glimpse of what investors thought the company was worth. Much more than $14 per share. The vote to go private failed with only 39% of shareholders voting for the deal. The company is currently trading for $33m against a NCAV of $29.4m and a book value of $84m. Substantially all of the company's current assets are comprised of inventory. There only other asset of note are their storefronts. It's not hard to see why this company is a net-net. Their balance sheet consists of inventory and real estate, most in less than desirable rural locations. Their earnings are spotty and inconsistent. The company's biggest problem is their gross margins have been trending downward. With a going private transaction off the table shareholders now have two paths forward. The first is the company continues business as they have and hopefully generate consistent profits at some point in the future. The second is that some of the larger shareholders get involved in the company and force an acquisition or sale at a much more equitable price for shareholders. Under a nothing changes model the company's stock is worth $9.37 according to the DCF calculator. I then adjusted SG&A expenses. If the company were to reduce their SG&A expenses 6% the valuation jumps to $32 a share. Likewise increasing their gross margin to 33% gives them a value of $36 a share. A DCF model is prisoner to a number of assumptions, but the model is useful in showing that even a very small change in in the company's cost structure could result in a much higher share price. The company's management sees value in what they're running, otherwise they wouldn't have tried to purchase the company. Heartland Advisors, a value based fund also sees potential, they've build an 11% position in the company. Where things go from here is anyone's guess. The company's SG&A, a significant expense this past year, have been slowly shrinking. Maybe expenses can't be cut anymore, although I somehow doubt that. Director compensation alone ran $300k last year. Executive compensation for the three named executives topped $1m. Those are quite large pats on the back for merely staying in business. I would imagine there are other expenses that could be cut if management had the will to do so. I enjoy the oddities of the market. I find companies that don't conform interesting. The exceptions are what keep me interesting in investing. If investing were merely a formula I would lose interest quickly. Good companies increase in value, bad companies fall. It's the strange little companies that don't neatly fit into a classification where fascination is found. These ugly ducklings aren't the mega-corporations everyone is familiar with, they are local companies that we can relate to. Cemeteries develop like cities. At first the plots are rural, plenty of open land and distance between neighbors. Then the place becomes popular, demand increases, and the plots become much cozier. Eventually the place is mobbed and skyscrapers of marble are built to house residents. I doubt many people think about cemeteries. They're as popular a thought as death itself, something most would like to forget exists. So it was interesting to me when I found out that there is a listed cemetery company in Canada; The Park Lawn Corporation (PLC). I was enthralled by the prospect of investing in a cemetery company. Finally a business where customer service didn't matter. A business with unlimited pricing power. If Aunt Hilda's will says she's being buried at Heaven's Gate then that's where she's going to be buried no matter the cost. But as it often happens in my research I didn't stop at The Park Lawn Corporation, I ended up finding the Park Lawn Company Limited (PRL). I don't imagine cemetery directors being a very creative group, so the similarity in names is not unexpected. Park Lawn Company Limited is a small spin-off from Park Lawn Corporation that owns half of a duplex and 2.9 acres of land in North York, a suburb of Toronto. Initially Park Lawn Corporation intended to build a two story mausoleum on their property. The company had the property re-zoned from residential to accommodate the mausoleum. Sometime in the past twenty years the Park Lawn Corporation decided they didn't want to build a mausoleum at the site and let it sit dormant. They spun off the property into the Park Lawn Company Limited. The company has petitioned the City of Toronto to re-zone their property back to its original residential zoning. 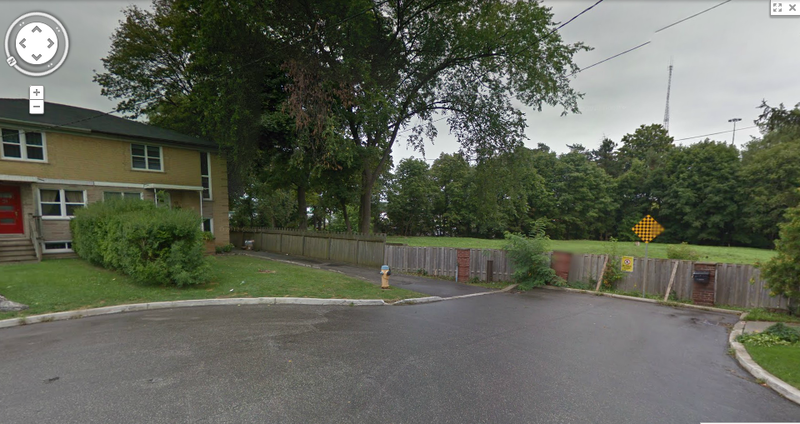 The company would like to fill their property with one detached home, two semi-detached homes, and 23 town homes. The company's re-development plan sounded promising until I realized that right beyond the line of trees in the picture is a giant freeway junction. The company's balance sheet is somewhat interesting. They have a mortgage on the house they rent out for $278k. Otherwise they have no debt, just a few payables. The company's asset picture is a bit murkier. They own the house and property discussed above, and both are held as assets. The company also has a small amount of cash. The most intriguing is their $5m promissory note to Park Lawn Corporation, on which Park Lawn Corporation is paying 5.5% interest with a ten year term. The loan is very generous to Park Lawn Corporation allowing them to extend it indefinitely, and to repay it at any time without a penalty. Park Lawn Company Limited's book value is $7.6m, which is more than double the current market cap for the shares. The company's balance sheet is in great shape and holds a lot of potential value for shareholders. Their income statement is a different story altogether. The company's source of income is rent from their residential property, and from interest payments on the note they hold from Park Lawn Corporation. Their expenses should be related to upkeep of their property, and a skeleton staff required to move the redevelopment project forward. Instead the company has found a way to spend $250k to date on SG&A. At their current run-rate SG&A will exceed $300,000 for the year with ease. It's hard to fathom what a tiny company that owns half a duplex and an empty lot is spending $300k on in SG&A until you read the footnotes. Park Lawn Company Limited's SG&A appears to be a bill sent from a Director at Park Lawn Corporation for their service to the company. The company has been able to operate at a loss presumably in an effort to avoid taxes, which they've been successful with so far. I wouldn't expect Park Lawn Company Limited to ever turn a profit, unless their housing development progressed to completion. If they are able to re-zone their property and build the residences they desire it's likely their asset value could increase dramatically. It's possible in theory that their income would increase as well, if they don't find a way to drain it via a consulting agreement. Park Lawn Company Limited is both a bet on Toronto real estate, and a bet on their zoning board. If the bet works out shareholders would profit, if not they'd continue to own a piece of empty land next to a freeway. If it hasn't happened to you yet it's just a matter of time. Right now you read my blog and love to see some of the strange stocks I profile. That is until I profile something you like, and something you "found". Then my site goes from an enjoyable read to an unmentionable. Everything is great except for that one post that you wish I'd rescind. This shouldn't be a surprise to anyone, but I don't believe that keeping ideas secret, or not sharing ideas is the best course of action. By writing this blog I've established for myself that I find value in giving ideas away for free, and I don't believe talking about investments or potential investments is bad. The fallacy of exposing ideas is the name I give to the idea that great investment ideas should never be shared, especially shared publicly. In this view a great investment idea should be hoarded and kept to the person who found it. I believe this desire derives from the fact that investors fear that once an idea is shared it will suddenly appreciate in price and they'll never be able to purchase another share. There are no hidden investments. As Proverbs states "There is nothing new under the sun", or the more modern expression "what was old is new again." Every investment is known by someone, if a company has shares it also has shareholders. Sometimes the group of people is small who know about an investment, and other times the group is large. Sometimes what is a hidden investment to us is really well known to a variety of people, it's just not known by us yet. If discussing and exposing ideas were such a bad thing we wouldn't be happy to tell friends about value investing. Why not hoard the knowledge in Security Analysis to ourselves? Maybe Seth Klarman tried to put the cat back in the bag when he took his book Margin of Safety off the market. The problem is if an idea is compelling we can't help but share it with others. Value investing secrets have been shared by a variety of authors over the years, and the methods discussed and exposed to a broad audience still work. Graham told the world about net-nets and cheap stocks, both which can be found today. Seth Klarman and Peter Lynch discussed mutual conversions, an idea that still works. Joel Greenblatt talked about spin off and special situation investing, a style still working today. Paul Sonkin has done a lot to spread the word about micro cap investments, an area still ripe with opportunity. There is a spokesperson for almost any potential investment. Want to learn about buying distressed debt? There is someone talking about it. Want to buy liens? There is someone talking about it. If you look hard enough there is someone talking about everything. When an idea, even a great idea is shared it doesn't suddenly appreciate to fair value. Even for the most illiquid stocks a little sunlight and exposure isn't a negative thing. Some stocks are illiquid because there is no buyer interest. There might be sellers, but no one to buy shares. When an illiquid company is highlighted and buyers appear sellers sometimes appear as well and liquidity improves. The main reason that exposing ideas is a fallacy is that markets aren't driven by perfect information, they're driven by emotions. This can be seen throughout this blog. I will post about a company that I think is a great investment and invariably I will have people commenting that I've lost my mind and made a mistake. The investor's largest enemy is themselves. We doubt ourselves, we second guess ourselves, we lack confidence and conviction. Other times we're over confident, or careless and miss important information. Different investors have different time horizons and different levels of acceptable risk. What is a great investment to one person is risky and reckless to someone else. As long as investors continue to have emotions they will continue to have differing opinions on the attractiveness of potential investments. And as long as differing opinions of value exist there will be a fluid market. Even when a market sage like Warren Buffett comes out and proclaims a stock is cheap there is dissension and disagreement. Some readers have accused me of using my blog to promote my portfolio holdings. I write about holdings because they're ideas I'm convinced are good. I'm excited about them I want to share them with others. This site wouldn't be fun to read if I had no passion for the companies I wrote about. Oddball Stocks would become as exciting as reading a student's dispassionate essay on a topic a teacher assigned. I write about what I find interesting, and as an investor I find my own holdings interesting. I also find other companies I might pass on interesting as well. Sharing ideas allows us to connect with others who might have more or better information. Sharing ideas also allows us to connect with people who disagree with our sentiments. Not many things in life are simple or straight forward. I changed the headlight in my wife's car yesterday. What should have been a simple task was needlessly complex and at one point involved the removal of her front grill. Most things are complex; relationships are, success is, parenting is, diet is. And of course business is complex as well, although if you read enough blogs, academics, and armchair CEO's you'd start think otherwise. Giving armchair advice is a well honored tradition in the US. Across the nation tonight tens of millions of viewers will be lounging on their couches offering advice on what the coaches and players should be doing. Disregard the fact that most of them couldn't catch a football, or run 100 yards, it doesn't matter, these viewers are suddenly experts and know better than participants on the two best teams in the league. As in sports the same is true with business. Investing is mostly a passive activity, we read about a company, make a decision and then wait. During the length of our investment we might witness a management team's mistakes, or their actions which result in success. Unless we're an activist investor we are simply watching from the sidelines. We commit our capital and hope things work out, it's an educated hope, but still a hope. While we wait for an investment to work we might read about the success and failure of other investments or companies. Eventually with enough experience, or enough reading we start to think that we know what a company should do. The problem is reality is no case study. The business world is much slower than we'd like, and full of emotions and relationships that drive decisions. All things that we aren't privy to on this side of the screen. My favorite type of armchair advice that's offered to executives is on the subject of turnarounds. I can't tell you how many write-ups I've read where the author will offer up a few simple steps, which presumably if taken will fix everything. If only life were that simple. I sometimes wonder if success were so simple why don't these authors write the CEO and offer their advice. Maybe the CEO never considered trimming unnecessary expenses, or increasing sales, or expanding geographically. We're only fooling ourselves if we think that management is really that dense. Do you think they never considered selling their crown jewel property, or making staff cuts? If increasing sales is really that simple why aren't sales increasing? To understand why a turnaround, or fixing business problems is so complex let's think through some paradoxes. Why is it that a store can have three locations doing the exact same thing with varying sales? Why do some stores underperform? When management scouted locations they thought they had a promising location that could generate sufficient traffic, why would they knowingly open an underperforming location? Why is it that something that was a popular and successful brand a decade ago can be a has-been brand today? Why did consumer tastes change such that the company, which continued business as usual failed? Why can two companies develop a similar product and one company finds success with it while a second company experiences failure? There aren't simple answers to any of these questions. There could be a different explanations for each situation, but most resolve around people. A business is a collection of people all attempting to move in the same direction and accomplish something together, which is generating a profit. Some groups of people do this better than others for reasons too numerous to count. A company with a distinct competitive advantage can lose it if a few key personnel leave and the company's culture changes. Likewise an underperforming company can become a cash machine with new management that understands the market and is able to motivate employees. The problem for investors is that we don't and can't know any of this without knowing both management and their employees well. Sometimes managers or employees make what seem to us like strange decisions because their careers and paychecks are on the line. Or maybe there's a key employee who can make a strong and compelling argument that the market will turnaround, or a key asset shouldn't be sold, we just don't know. I'm always wary of academics, or investors who will offer drive-by advice on how to fix a business situation. A company will encounter trouble and suddenly a college professor or portfolio manager will offer a few platitudes that if the company implemented would solve their problems. If all it took were mental models, or case study solutions why aren't professors or portfolio managers ever CEO candidates? I've seen the opposite happen, a portfolio manager gets voted to the board of a holding and suddenly the easy solutions aren't feasible, and making changes at the holding are more difficult than expected. The question is how do we get comfortable making an investment without interviewing every employee at the company to understand what's happening? I think the answer is we need to let the company's financial results speak for themselves. A company with excellent management and an exceptional culture will have exceptional results. Every company claims to have a great culture, true outstanding cultures will be set apart by superior results. Similarly a company with poor management and poor culture will have poor results. The best way to invest in a turnaround is to invest after the company has already started to turn around. Management will have shown via the company's results that their actions have been successful. I think there's a misconception about how I invest at times. I like to buy cheap companies, and cheap assets, but I prefer to avoid turnarounds. I prefer companies that are ignored and misunderstood, or that have under utilized assets. It's hard enough to run a successful business, it's even harder to change a company's culture, or to turn around a company that's encountered difficulties. Business is complex, there are many seen and unseen factors that influence decisions. The sooner we recognize that, and accept it the better off we are.